Pain in your abdomen is far from being a simple issue – it can be caused by any number of health conditions. Finding out exactly what that health condition is means taking the most important step, which is to see your primary care doctor for examination, possible testing and diagnosis. But have you ever wondered just how your doctor figures out what is wrong? In the world of abdominal pain, your doctor is a vital person with a wealth of tools at his or her disposal to find out what is ailing you and how to develop the right treatment plan. Your doctor has some basic tools to find out just what is causing your abdominal issues. The first is to look at the characteristics of your abdominal discomfort. 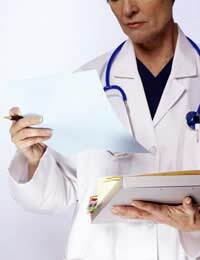 Then, your doctor will look at what a physical examination shows. After that, tests may be ordered, which can range from laboratory testing to an endoscopy. Finally, surgery may even be needed. While we tend to think of surgery as a treatment for a health condition, it can also be important for sampling tissues or getting a clear image of what the inside of your body looks like, in ways that a scan may not be as successful. To find out the characteristics of the pain, your doctor will want to take a full medical history as well as find out where the pain is located and if it occurs after any specific event, such as exercise or eating a certain food. Your doctor might want you to rate the pain, using a pain-scale, or describe the pattern of pain, such as steady, crampy or piercing. Also important will be how long the pain lasts once it starts up. For instance, pancreatitis tends to trigger very intense pain that doesn't seem to ease. On the other hand, people with Irritable Bowel Syndrome (IBS) have pain that comes and goes over a long period of time. This kind of pain also varies in its intensity and patterns. Your doctor will want to find out if you have any other symptoms, such as a fever. A fever would likely indicate that your body is fighting an infection or there is inflammation somewhere in your body. After taking a thorough history and asking questions, your doctor will move closer to diagnosing your abdominal illness by performing a physical examination. During an examination, your doctor can determine any sounds or signs of inflammation or obstruction. Also, any tender spots or the identification of a lump or similar mass could indicate a tumour or infection. In this case, it would be particularly important to move on towards testing to find out more about the mass. We are fortunate today to have a large number of tests available to help a doctor diagnose abdominal illness. Once your doctor has conducted a history and performed a physical examination, tests such as laboratory blood count tests or liver enzyme tests might be conducted. These can indicate how your organs are working and influencing your digestion. They can also suggest an infection, namely when blood counts aren't normal. X-rays of your abdomen can show obstruction and similar problems in your abdomen. An ultrasound is especially helpful for identifying gallstones while a CT scan can help to diagnose cancer or appendicitis. An endoscopy can be important for cancer as well, primarily bowel cancer. If less invasive tests aren't sufficient, your doctor may then order surgery to find out more about your abdominal symptoms and signs. The main goal of all these examinations and tests is to diagnose your abdominal illness and do so accurately and as quickly as possible. This means your doctor can formulate the right treatment plan, hopefully leaving you healthy and pain-free.